The blooming Spanish startups scene continues its constant growth, accounting now several thousands of companies. And each and every day we find new success stories from the Spanish startup ecosystem that inspire both professional angel investors and VCs from all across Europe to discover the Spanish Miracle. That’s why Startupxplore, with the help of some of the most notable investors in Spain Tech, has tried to shape this reality in the form of a periodic table, where the top startups, accelerators and most influential investors from Spain are shown. We have also created an interactive version of the table, where you’ll be able to access the profile of each and everyone of these startups. Media and advertising: like Play Space or Social Point as leading companies. Health or travel / leisure, sectors that grew in 2015 by 53% and 41% respectively. Here, Cabify, Hot.com or Broomers are some of the companies most voted by investors. Fintech, E-commerce, employment and education software: in the central part of the table, you’ll find some of the most active markets ins Spain. For example, you’ll discover among the most prominent startups, companies like Indexa or Digital Origin in Fintech; Hawkers, Packlink or Wallapop in E-commerce; Job & Talent and Tutellus employment / training or Sherpa and Typeform in Sofware. We have also gathered the major firms Venture Capital, Business Angels and Accelerators of the Spanish ecosystem, located to the right of the table. You’ll find there firms like Kibo Ventures, JME Venture Capital, Caixa Capital Risc or Cabiedes and Partners, and also top business angels like as Carlos Blanco, Yago Arbeloa or Jesus Monleón and accelerators as Conector, Seedrocket or BBoster, among others. Finally, you’ll discover at bottom of the table some of the most notable Spanish ‘exits’ in the last years. Such as Privalia, La Nevera Roja, Idealista, El Tenedor, Infojobs or Rumbo. Methodology: Each and every one of the companies listed in the table are there because they have been voted by top investors and accelerators that are part of the community of Startupxplore, according to their futre impact, perspective and the growth potential inside their markets. CEO & co-founder at Startupxplore.com. Entrepreneur & investor. 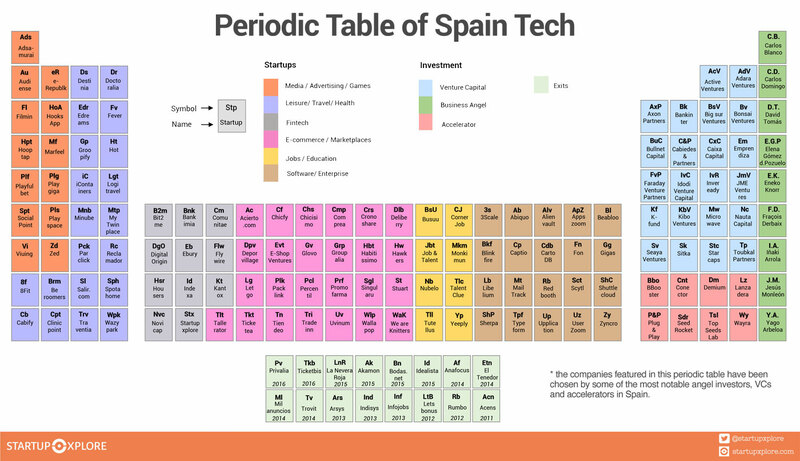 "What Spanish venture capital does is not exactly what VC is about"